Whistler is the ideal location for teambuilding events with pre-planned activities on offer to help your business develop dynamic leaders, improve team work and motivate employees. 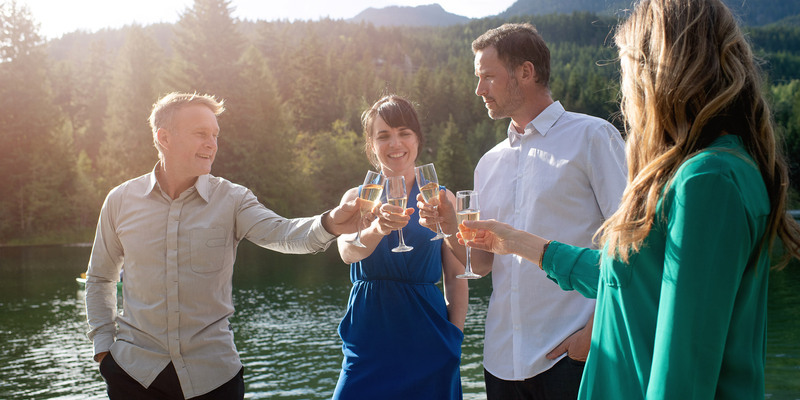 Improve happiness and productivity in the workplace - book a team activity or retreat in Whistler today. "Regarding the service at Whistler.com, I have said absolutely great things to a whole bunch of people about how much help Dean and Jenny were. I would 100% recommend that anyone planning a group event in Whistler get in touch with you. I have heard nothing but positive reviews from all of the participants and my quadriceps are finally settling down after too many runs at the bike park." A team activity for everyone. A fun and creative teambuilding activity, perfect for groups of 10 - 25 people. Walking through parks or trails with the artist, discovering and drawing the flora, fauna, landscape and activities of the Whistler and Sea to Sky region along the way. Led by an experienced artist-teacher, these two to three hour workshops includes all equipment with particpants taking home their sketchbooks at the end of the session. For more information, please contact our Group Sales Specialist on 1.866.299.6971 or click to email. A teambuilding event based around a race to the finish. The Amazing Chase is an outstanding teambuilding event combining communication skills, planning, strategy, teamwork, and a race against the clock. Anyone can participate as no special skills, athletic ability or experience are required. Groups from 8 to 1000+ can participate at once. Each team’s goal is to complete the race course in as little time as possible. In order to do so, teams must interpret a number of "clues" to locate up to 10 Route Markers. At the conclusion of the race, a trophy and medals will be awarded. The race can finish at a location of your choosing including the group’s hotel or perhaps a popular restaurant or landmark. Turn your team into detectives and test their observation and problem solving skills. We’ve adapted the theme of crime investigation into an entertaining group format, allowing teams to compete in a creative and exciting activity. With each member proficient in a specific navigational or crime-solving skill and using their powers of detection and deduction, teams must work together to navigate their way through a series of crime scenes. Each location is staged as a crime scene where teams must carefully search for clues, preserving and documenting evidence to solve the case. Upon completion, the teams hand in their evidence and receive lab results from the crime lab. Their final challenge is to interpret the meaning of the clues and evidence and attempt to solve the mystery: who has committed this shocking crime! Stay on budget with self-guided team building experiences. Use smartphone apps to make your next activity fun and memorable. Teams work together in a tribe like scenario and compete head to head in "Survivor" style challenges. An opening ceremony kicks off the Corporate Castaways event with the introduction of each tribe. Tribes are encouraged to theme themeselves and accessorize prior to competing. The competition is made up of 9 different challenges with many based on the original "Survivor" TV show. Challenges are designed to address trust, leadership, strategy and communication. A hands-on approach to corporate resposibility with team building activities aimed at giving back. These are just a selection of the events on offer - contact us for the complete range of teambuilding activities and options.